The Certified Identity and Access Manager® (CIAM) designation is a registered and vendor-neutral certification which is recognized globally as the Gold Standard information security certification for identity and access management professionals. The program offers comprehensive training with online study materials, video course, and exam to certify candidates and improve their career advancement opportunities in the fastest growing segment of cybersecurity. Identity and Access Management (IAM) is the most important discipline of information security which aims to manage user identities and their access to enterprise resources and data. IAM governance and programs including policies, processes, and technologies manage user identities and enforce what they can access and do within a system through authentication, authorization, and accounting. CIAM® professionals continuously assess their organizations’ existing capabilities in the identity lifecycle to prioritize business investments, close compliance or control gaps, and identify process improvements to reduce costs. Interested candidates must be members of Identity Management Institute, apply to receive the study guide, and pass the online examination to become certified. The CIAM application fee is $295 which includes the study guide (50 pages) and online exam. Candidates who are not members of IMI may submit the membership application and CIAM application at the same time. The CIAM examination consists of 100 multiple-choice questions. Candidates must answer at least 70 questions correctly to pass the exam and become certified. Registered candidates can schedule the exam for up to 3 times at no additional charge which can be taken on any day and from anywhere on desktop computers or mobile devices with Internet access. Please take the practice test to become familiar with the final test format and content. 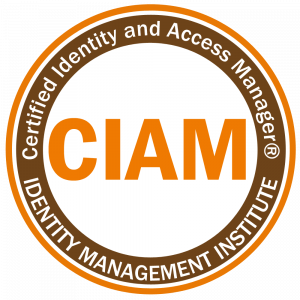 A short video training about identity and access management is available to teach exam candidates as well as those who are contemplating to become certified about the core topics of the CIAM program. Click here to preview and purchase the video course. 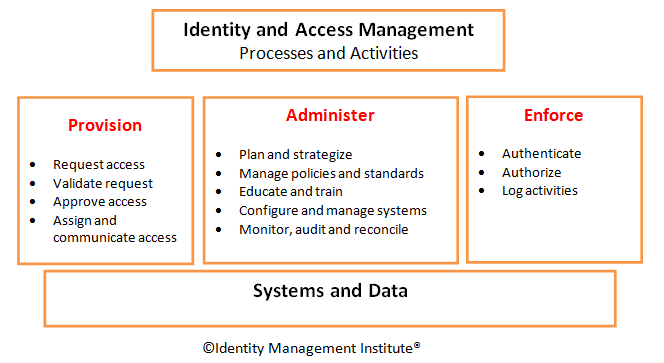 The image below illustrates identity and access management processes and activities which define the scope of the CIAM program. Although technology is an important part of identity and access management, adopted solutions in the past have often focused on just technologies which were poorly designed and implemented resulting in high costs and limited value. Organizations often struggled to meet compliance demands, and the solutions were deployed to manage limited number of systems. As companies become more aware of the urgent need for managing identity and access management risks, meeting compliance requirements, and countering various threats facing their organizations such as cyber crime, the benefits of implementing an effective IAM program and technology, as well as employing highly skilled Certified Identity and Access Manager professionals become apparent and are brought to the forefront for managing risks. From a regulatory compliance standpoint, there are many overlapping laws pertaining to customer identification, privacy, transaction monitoring, government reporting, and fraud prevention that companies must manage as effectively and efficiently as possible. For example, companies are required to establish a formal Customer Identification Program (CIP), monitor account activities, ensure the security of customer information, report suspicious activities, and prevent identity fraud. Although, identity and access management processes are critical for protecting consumer information and complying with privacy and other regulations, IAM is evolving beyond compliance to become a risk-based function that can help an organization achieve competitive advantage through state of the art technology such as biometric authentication, lower operating costs, increased efficiency, and reduced risk of security breaches. Download a copy of the CIAM program overview document for a description of all CRDs. Identity Management Institute members who earn the CIAM professional designation are identity and access management experts who work for a variety of government agencies, businesses, and technology companies worldwide to design, implement, improve, or manage identity and access management programs, processes, and tools. Identity and access management risks continue to evolve worldwide as new threats and solutions are introduced, and laws are implemented. Specifically, cyber crime, identity theft, and related fraud are on the rise and various governments are scrambling to address privacy and manage risks through regulations. A CIAM designation validates professionals’ qualifications for helping their organizations meet compliance requirements and managing identity and access management risks which can affect the integrity, availability, or confidentiality of systems and data. System and network security controls alone can not protect an organization’s critical assets if identity and access management controls are weak or do not exist. A CIAM designation and IMI membership also illustrate the fact that certified members value professional involvement, maintain an interest in identity and access management topics, have relevant professional experience, and contribute to their profession. The CIAM application fee is $295 which includes the study guide and exam fees. IMI uses PayPal and other third party credit card processors to request and receive international credit card payments after applications are received. Alternatively, candidates may print the invoice and mail a cashier’s or company check.